Hello everyone! I’m back with a new guest designer spot for Stamping Bella. Christmas is almost here! I can’t wait! I love the holiday season and Christmas is so magical! I went for pink! I thought it would work well with these cute little elves from the Little Bits Set of Elves rubber stamps and I really like the result. I started by creating the soft pink background. I used various pink Distress and Oxide inks. I pressed the ink pads face down onto a craft sheet, spritzed water and pressed my piece of paper onto the craft sheet. I dried the paper using a heat gut and repeated the steps until I was happy. Once it was dry, I die cut the watercolored paper with a stitched die for more interest and a great finish. I adhered the panel to a white top-folded card base using foam pads. Next, I colored the super sweet elves using pink shades. The Christmas candy is from the same set as the elves and I colored it in rainbow colors. The "EAT, DRINK & BE MERRY" sentiment was computer generated. I cut around to create a small banner. I then cut the elves and I die cut the 25 from glitter paper. I fixed all elements with foam pads to the panel for more dimension. I added a lot of enamel dots as a finishing touch. 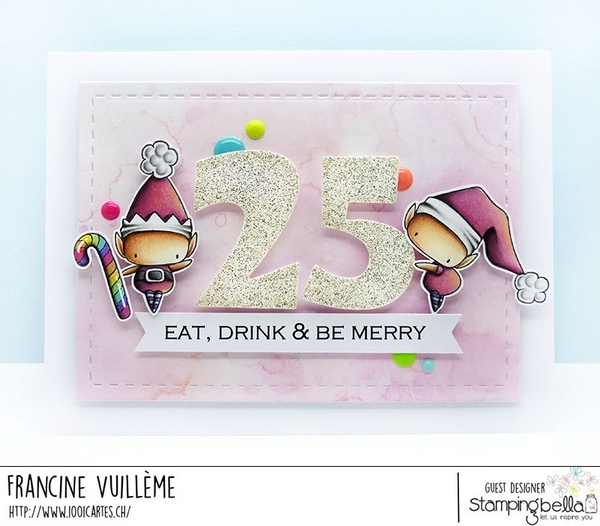 The colorful dots as well as the rainbow Christmas candy make the card so playful and happy! 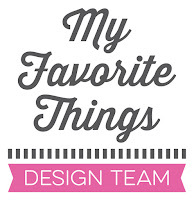 See you soon with more Stamping Bella inspirations! Happy crafting and don’t forget to eat, drink & be merry! Wow! Just when I think that your amazing coloring skills don't surprise me anymore, you go and create a stunner like this one! Jaw-dropping, eye-popping FABULOUS CARD! Gorgeous Francine! Your colouring and design are out of this world! Your elves are so cute and I love that you chose pink for this card! Merry Christmas, Francine...enjoy your holidays!! !